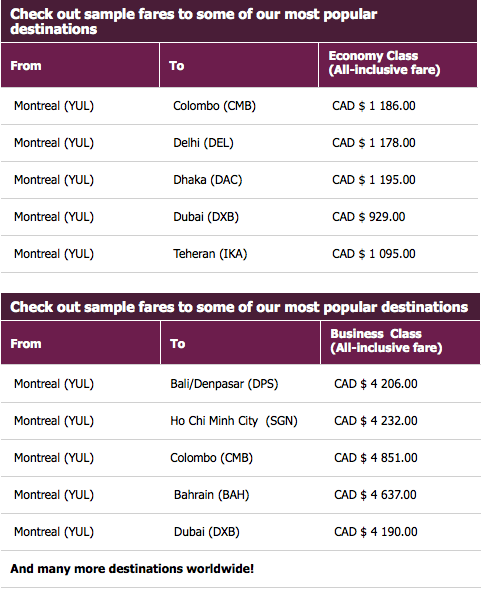 Qatar Airways has launched a new seat sale on flights out of Montreal to over 100 destinations Worldwide. Fares start at $929 all in for Economy Class and $4,190 for Business Class. Tickets must be booked by January 15th for travel between January 20 and June 18 then July 5 to December 10. Remember that if you connect to a flight that is flown with Qatar Airways' A380 (like Doha-Bangkok QR836, QR833) you can earn up to 100% Bonus QMiles and Elite Status Upgrades. For more on the bonus miles offer see here.